This is your chance to own a profitable Quiznos in a AAA location. Positive company changes implemented by the CEO have really translated to good profits for this operator. This unit opened in 2001 and has been going strong ever since. The owners would like to retire from the sandwich business and have decided to sell. The location is a good size at 1360 square feet, with rent of $5,740 that includes the CAM. The Customer base has been built over the last 7 years and is in an amazingly high traffic area. The shopping center is in a AAA location with some national chain restaurants to add to the draw. The monthly gross sales for this location are around $32,000. A New delivery service was just implemented for increased revenue potential. If you are still interested then take the next step and complete the online confidentiality agreement and you'll be provided with the restaurant address. Also you will given priority notification to new listings in the future, prior to the general public, giving you the best chance to "scoop in" the best opportunities. There are also more photos available to our registered buyers. Positive company changes implemented by the CEO have really translated to good profits for this operator. A New delivery service was just implemented for increased revenue potential. 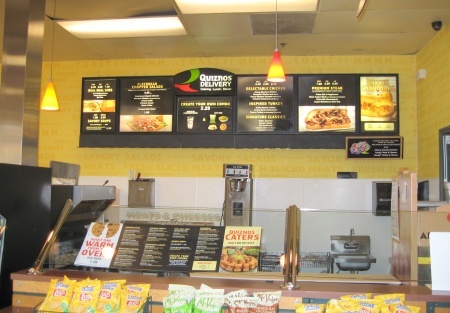 Profitable Quiznos in a AAA location.